nintendo reported earlier today that its sales for the ds lite have reached 136 500 units in two days. If it reaches 500 000 in ten days it will match the ds fat’s launch sales. Also of note it is outselling the very popular gba sp on its launch day by a rate of 12%! :D Lastly sales of brain age and new super mario bros have widely increased. Lets see if the ds lite can maintain its momentum. With two of the nation’s top-selling games and a hot new look to the hardware, the global Nintendo DS phenomenon has become more popular than ever. New Super Mario Bros.(R) and Brain Age(TM): Train Your Brain in Minutes a Day for Nintendo DS(TM) ranked as the No. 1 and No. 3 best-selling games of May, according to the independent NPD Group. And Early reports from major retailers indicate that those same titles are being scooped up with the new Nintendo DS(TM) Lite in advance of Father’s Day. * After going on sale May 15, New Super Mario Bros. sold at a nonstop rate of roughly one every four seconds nationwide during the reporting period. * New Super Mario Bros. emerged as the No. 1 game of the month, even though it was in stores for just 13 days of the four-week reporting period. * Just two days after Nintendo DS Lite went on sale in the United States on June 11, the new lighter, brighter portable system sold more than 136,500 units, with many retail outlets reporting sellouts. * By comparison, DS Lite is outpacing 2003’s launch sales of Nintendo’s juggernaut Game Boy(R) Advance SP by more than 12 percent. * Major retailers report that sales of Brain Age: Train Your Brain in Minutes a Day tripled over the previous week. 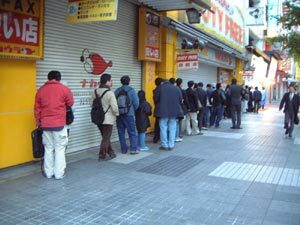 * Retailers also report that New Super Mario Bros.(R) sales doubled over the previous week.